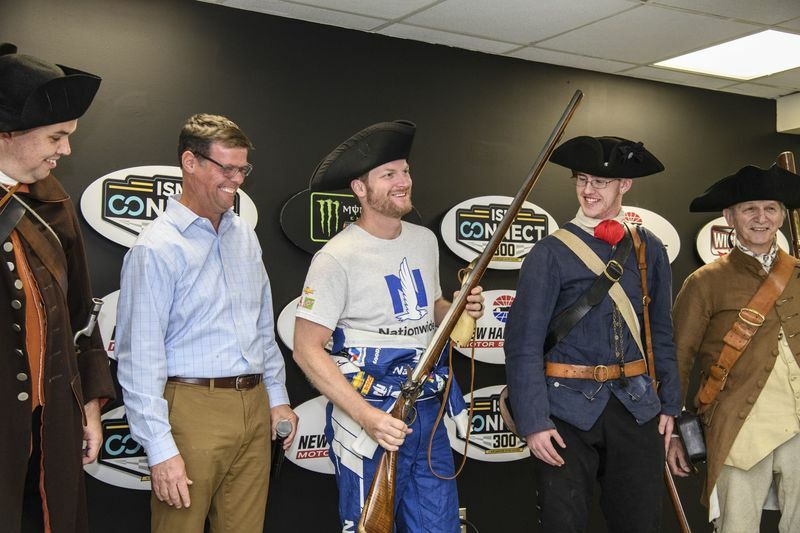 Flanked by Revolutionary War Minutemen, Dale Earnhardt Jr. received a New England-themed parting gift from New Hampshire Motor Speedway on Friday. 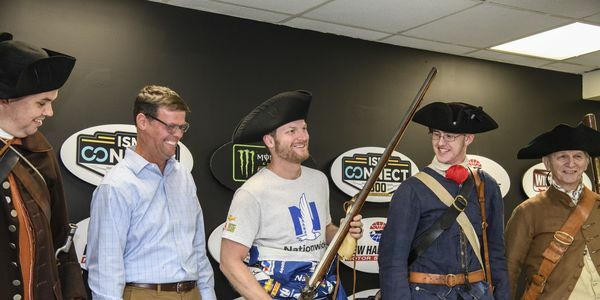 The Monster Energy NASCAR Cup Series driver, who will make his final NHMS start in Sunday's ISM Connect 300, was gifted a custom-made Flintlock Musket, powder horn and tri-corner hat during Friday's Appreci88tion Tour ceremony. Earnhardt, who donned the 18th century garb for a photo with the Minutemen, also received an $8,800 donation from the New Hampshire Chapter of Speedway Children's Charities. The money will be used to provide the Injury Prevention Center with nearly 600 kids' bicycle helmets - double the normal distribution - to be handed out at the newly named Dale Jr. Foundation Safe Kids 301 at NHMS next spring. "That musket is pretty awesome. I definitely don't have one of those. We'll see what (Martin) Truex thinks about that. He might be pretty jealous," said Earnhardt, who also received a proclamation from New Hampshire Governor Chris Sununu, declaring Sunday, Sept. 24, 2017 as Dale Earnhardt Jr. Day in the Granite State. "This is pretty cool to have the track do this. And the donation, that really means a lot to me." The Flintlock Musket was built over the course of three weeks by Blackhart Long Arms out of Eastford, Conn, which has twice been featured on the History Channel. Using a blend of tiger maple and brass, Blackhart engraved the musket with Earnhardt's initials as well as the words "From Your Friends at the New Hampshire Motor Speedway." The powder horn is also engraved with Earnhardt's name and the N.H. state motto: "Live Free or Die." "We wanted to give Dale something that truly captured the spirit of New England," said McGrath, executive vice president and general manager of the speedway. "Dale has been a tremendous ambassador of this sport and an amazing competitor. We will certainly miss seeing him out on the track, but we know this isn't the last time we'll see him here at New Hampshire Motor Speedway." The Dale Jr. Foundation Safe Kids 301, formerly known as the Safe kids 500, is an annual free event that promotes bicycle safety and provides free helmets to children to protect against head injuries. Kids and families are also allowed to ride their bikes around the speedway's 1.058-mile oval, which is made possible through a partnership with Children's Hospital at Dartmouth-Hitchcock (CHaD) and Safe Kids New Hampshire. "Helmets are critical because it's going to save those kids from injury and it's going to carry on down the road and have a bigger impact than what we can imagine," Earnhardt said. "This is all just great. The track's been great over the years. I've really enjoyed racing here and the New England fan base is so passionate about their racing. I will definitely be back; this won't be my last time coming here." Earnhardt made his first-ever start at the speedway on July 11, 1999. His best finish came on Sept. 19, 2004 when he finished third. Earnhardt enters Sunday's ISM Connect 300 with 15 top-10 finishes, including eight top-fives, in 34 career starts at NHMS.